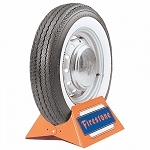 ●Worlds best selling line of vintage bias tires. ●Made in the original molds to maintain authenticity. ●Authentic Firestone lettering in the whitewalls. 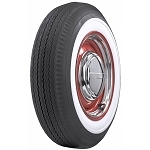 ●Actual whitewall tire, not added after the tire is made. ●US DOT and ECE approved where applicable. ●All 13 to 15" tires are tubeless. ●16" tires and up require tubes. We cannot accept tires that have been mounted.